Putting you in my sidebar next Sylvie. A gorgeous card Sylvie, love the very cute image and the papers and details are beautiful. What a lovely candy...it's allready on my sidebar! Congrats with your many followers! 300 - oh wow that's a lot Sylvie - congratulations hun you deserve it! Your cards are always beautiful so I'm not surprised you have so many people following you. Congrats on your 300 followers Sylvie....wow wha fabulos candy and thank,you for giving us a chance to win . Congrats on all the followers, you deserve them :) Thanks for the chance to win too! I'm off to put it in my sidebar now. Already following...just put your candy photo and deets up in my sidebar. Hope you make your 300...your cards are so lovely I am sure it won't take you long! Congratulations on nearly reaching the magic 300 followers (don't you just love round numbers!! LOL!!). Thank you for all your inspiration and fabby makes. 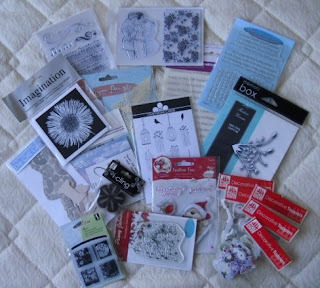 You have some gorgeous goodies in your prize .. .. some I have never seen before!!! Here's to the next 100 followers! Such a pretty candy!! Will put it in my sidebar.. Yes blogging has changed our crafty lifes.. I'd love to be entered into you candy giveaway. Good luck on reaching 300! Thank you so much for inviting me to you blog candy! Your cards are fab, so nice that you became a follower of my blog :) Im also a follower of your blog now! I really like to join your candy! Wow, what fab candy Sylvie! I've popped a piccie on my side bar! Just like the others, I can't imagine not having a blog! I love showing what I've made and looking to everyone else's creations! Wow Sylvie, so many followers...it is wonderful...I am sure you will get to 300 & more!! Thanks so much for the chance to win.I have shared on my sidebar. Lovely candy Sylvie, will pop in my sidebar. Well done on all your followers. Congrats Sylvie! I have just reached that milestone too and need to sort out some candy. In the meantime, thanks for the chance to win yours - it's fab!! Huge congrats Sylvie hunni. It is a nice feeling to see your follower numbers grow isn't it? Lovely candy too sweetie, popping along to add it to my sidebar just now. Thank you for the visit. I add your picture in my sidebar. Hello Sylvie, I am here for the first time and your new follower. I added the candy on my sidebar, thanks for the chance to win. Hi Sylvie, Congrats on your 300 Followers. Fabulous candy here. Thanks for the chance to win. I added your candy on my sidebar. Well done. Lovely blog and lovely candy. Thank you for the chance to win. Hi there Sylvie! It's my first time to visit your blog and I have to say I love what I see! So many lovely cards. Way to go girl! Oh and congratulations on reaching the big 300! Thank you for the awesome candy, too! Hi; Gibraltar seems just a lovely place to live! I wish I was there too instead of this sow/water/rain pouring down every day between November and April.. in Sweden. Greetings and thanks for a chance to win a nice candy! I would love to be entered! Congratulations on reaching over 300 followers! Congratulations, Sylvie! Honoured to be on CCC with you! Well done Sylvie on your follower count, great cards get great followers. Congrats. Your candy is really great!Thank you for the chance! Congrats on all the followers. Lovely candy. I wish you lots of new ideas. Congratulations ♥ Thanks for giving me the chance! 300 followers - wow, congratulations! Blogging does become addictive as I have found out, but I think it is a good addiction (not sure my husband would agree! lol). Thanks for the chance to win your lovely candy. Hello, Im a new follower and congrats on your 300 followers!! Here's onto the next 100!!! Just found your blog - lovely cards! Congratulations on all your followers. Fab candy Sylvie, thank you for the chance to win - have added to my sidebar. Oh gosh.....!! Thank you so much for this incredible oportunity, 300 followers is a great goal! Congratulations!! Congratulations on your 300 followers and hope that you get many more. I have added your candy to my side bar and I now have my fingers crossed very tightly. Thank you to win sweet candy. I am a new follower of yours and thanks for the chance with this candy! After winning your blog candy last year I just have to enter this time, too. :-) You sent some of my favourite stamps - I really love the robot stamp and my mother has become a huge fan of the cute kitty on the flower pot. Again, your candy is amazing. Thank you very much for the chance to win. congratulations, Sylvie! your cards are lovely! Just found your lovely blog & am your newest follower. Thanks for the opportunity to win. Congrats on 300 followers and nice to meet you :-)Thank you for a chance to win. Your candy on a sidebar. Now there are 328 followers :) Love your blog. Congrats for reaching a high number of followers. Thanks for the chance to win your fab candy. Lovely blog, lovely cards, lovely candy. Thank you for the chance to win this awesome giveaway. I added your candy on my sidebar. Congratulations Sylvie, not surprised at all hun. WOW..congrats Sylvie. Your work is beautiful so I'm not suprised you have so many followers. And, I just became your latest one. Thanks for the great candy and a chance to win. wow It's my first time to visit your blog and I have to say I love what I see! So many lovely cards and love your candy Thanks for the great candy and a chance to win. Welcome. I want to take part in your candy! Am your recent follower. Accidentally stumbled upon your Blog while visiting a blogger friend of mine. Lovely creations on the Blog. 300 followers n that hould be feeling great,right? U sure deserve more. It is so generous of you to be offering this cute giveaway. Have placed a link to your candy on my blog sidebar. Thank you for the chance. Wow! I just stumbled upon your site and I love your style. I became a follower and also signed up for your emails. Thanks for a chance to win this awesome candy, I just recently started making cards and this would add to my collection quite well. Thanks again! I just stumbled upon your blog and I must say that I love your cards. And what a great candy you're offering. Hope to make a chance.